Would you like to improve your students’ writing skills and help them bridge the gap between writing in school and writing in the real world? 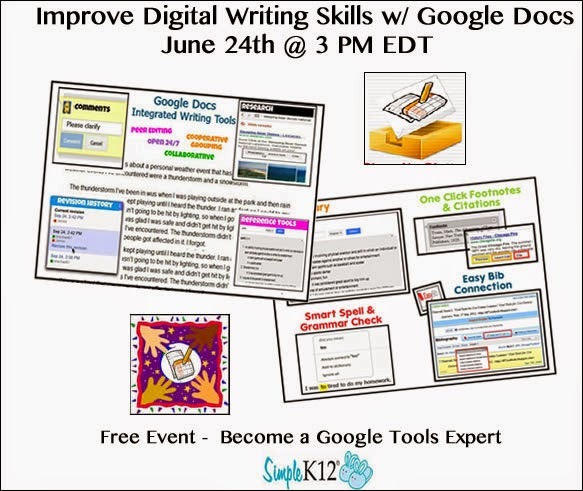 Join me and Simple K-12 for a free webinar on June 24th at 3:00 PM EDT to learn how to use Google Docs to thoughtfully incorporate digital writing into the curriculum. Sign up for this free webinar at Simple K-12. Be sure to check out additional webinars offered during this free online event to help you “Become a Google Tools Expert“. View more through the tab at the top of this blog. Is this will be on the net? Yes, you can view the live webinar as part of a free online event by clicking on the sign up link. Members of Simple K-12 can view the archived webinar at anytime in the collection of archived webinars.